The Olive Oil Diet describes a diet for life. It is a way of living which has been shown to help people not only to achieve and maintain a healthy weight but also to protect against chronic heart disease, strokes and much more. Winner of the World Best Mediterranean Cuisine Book – the Dun Gifford Prize – in the Gourmand Best in World awards, also the National Best Diet Book in the ‘for the public’ category. Is it true that two tablespoons of olive oil a day can halve your risk of heart disease and help sustain weight loss? Can olive oil kill cancer cells, fight Alzheimer’s Disease, revive a failing heart and even turn off bad genes? 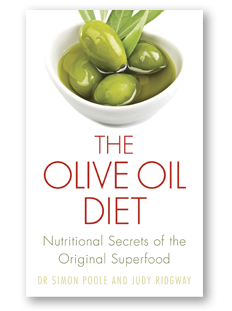 The Olive Oil Diet takes an authoritative look at the science behind the headlines. Recent studies have shown that a Mediterranean diet based around olive oil can significantly improve health, well-being and vitality and maintain a healthy weight. All olive oils are not the same, however. This book also explores the effects of diverse varieties of olives, growing techniques and oil-production methods on the health-giving properties – and flavour – of different oils. With over 100 delicious recipes, it points the way to those extra virgin oils and food combinations that are likely to do you the most good. This fascinating journey to the heart of the Mediterranean reveals the extraordinary health secrets of nature’s original superfood.